Last Saturday morning I stopped by my friend Doug’s house to borrow a waffle iron. 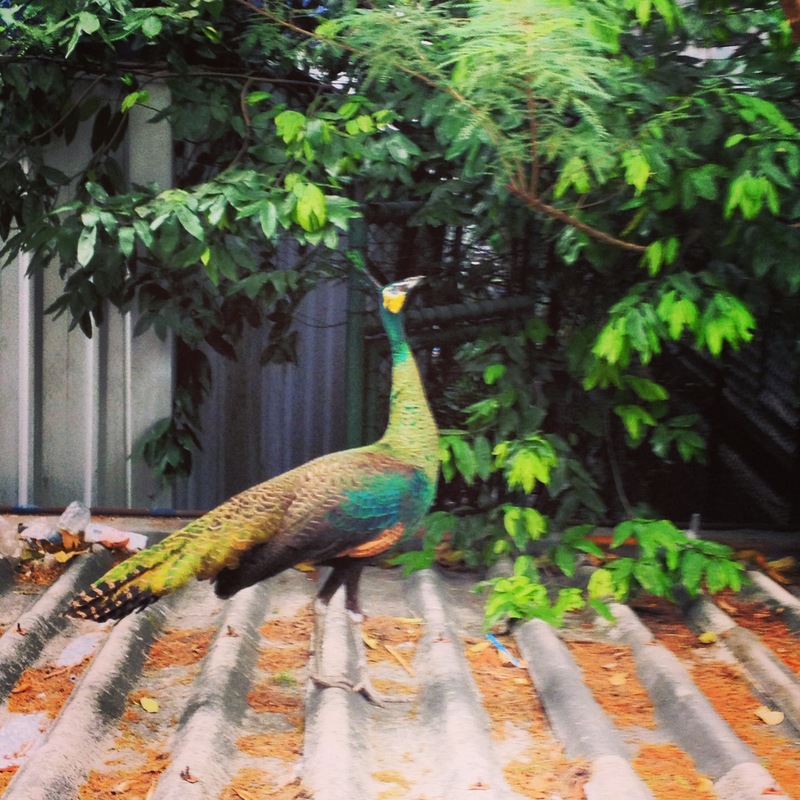 Parking on the second floor of the car park, I looked past the edge of the building and was startled to see a peacock. Approaching slowly so as not to startle it, I discovered that there was a corrugated roof covering the parking spaces on the ground floor. Strutting on this roof, pecking at the debris that had fallen from the adjacent trees, was this beautiful peacock. I watched for a few minutes, transfixed by its beauty and curious as to where the bird had come from. This entry was posted in Thailand and tagged peacock by christao408. Bookmark the permalink. Nice to find beautiful surprises like that in places where you least expect it. Life is so full of beauty that often pops up when we least expect it. I didn”t see the peacock the first time I read this post and now I do. Beautiful coloring and very regal looking. For some reason, the picture didn’t upload initially so I had to go back and add it. Sorry! Beautiful! Btw, that’s a peahen. 😛 Notice the absence of the tail? The peacocks (the male) have a long tail which it fans out during the mating dance. I wonder if that bird escaped from someone’s backyard. Peacocks used to be popular hereabouts. Haven’t seen one in years. now, why would such a beautiful creature doing in a city environment? a zoo escape? No, I think some people or properties keep them around. Good luck maybe? thank goodness i don’t believe in superstition. or i’ll end up with a zoo at my front yard. You just reminded me of some peacocks I used to see in a neighborhood near my house! I need to drive by and see if they are still on those roof tops! 🙂 I can’t believe I’d forgotten about them!